News: Join our Facebook Group! Become an Agent! Approaching A Series With A Challenging Backlog Do you have experience of struggling to begin a game series? I consider myself a gaming enthusiast and I often find myself searching for interesting games I may have past on previous consoles. In my findings I often hear of series with strong followings but upon looking I find the backlog intimidating – Especially when a series spans multiple consoles & generations to the point where it is really difficult to even get specific entries to a series. I've recently taken interest in the Ys series, which has required a lot of homework to understand the chronology of this series' timeline. For instance, I have been interested in the latest release on PS4 'Ys VIII: Lacrimosa of Dana' but see that this series is not like Final Fantasy – In where each title while in the same series does not follow on from one another unless stated so like X-2 of XIII-2 etc. Looking at Ys, it seems that VIII is actually roughly within the middle of the series an the two previous titles are actually set after it (So VIII, VI & then VII), While this does mean that this could be an interesting starting point with more titles to follow up on, it seems that the previous title Ys IV introduces an important main character Dogi who then appears in the later titles – So even starting with VIII I feel I am missing out. I may be wrong on that example as I have yet to play the series, but the fact that it has consistant characters throught out the series does mean they're of a series. I found this Timeline online from a user called Nightengale Seems handy but a lot of work to just undertsand the chronological order fo a series. I'm not someone who goes out an gets all the classic consoles, I'm mainly a PlayStation owner and Games/Collector, so when a series branches out onto multiple systems it can be hard for me to comprehend. Castlevania is another series that I have REALLY struggled to approach. On PlayStation it is a series that really branched with the popularity of 'Symphony of the Night' – Which in itself id inaccessible to to its rarity/price... I have the PSN version SotN of course is not the beginning of the series, even the introduction to that game picks up at the conclusion of the previous title – Which was on the Turbo Graphics? I looked into the series a while back and thought I'd try approach the series head on. The PS2 release of 'Lament of Innocence' (Which is just called Castlevania here in the UK) is apparently a prequel to the whole series, even the NES titles. So I gave that ago... while accessible admittedly I can see how it wouldn't be considered the highlight of the series. The next PS2 title released was 'Curse of Darkness', this title is a sequel to the NES version of Castlevania III... which is completely inaccessible to me. As of now I have failed to really continue my attempts with the series, I have got the 'Lords of Shadow' Reboot series on PS3 – But even getting all the DLC to that was a bother. Another series I've had a bit more success recently is with Yakuza series. The first of the series I played with Yakuza 3 and I had a nice time with it but if felt strange not playing the previous two games – at the time they we're extortionate... Yakuza 2 on the PS2 still is. The great thing about the Yakuza series is that SEGA has done a fantastic job in making the series more accessible in recent years. On the PS4 we've had the Prequel Yakuza 0 and then a Remake of the first game with Yakuza Kiwami! Both very accessible titles and a great introduction to the series. 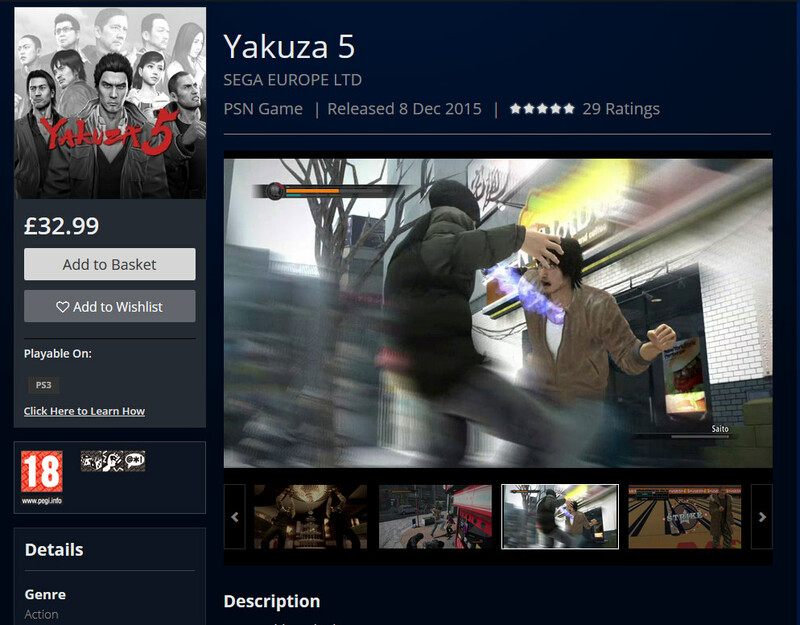 For years we never got a version of Yakuza 5 outside Japan, while we never got a physical edition, we still got a release on the PlayStation Store 3 years later. In a months time we're even getting Yakuza 6, barely a year after the Japanese release which is great! The only issue is that in Japan, they've already released a 2 remake of Yakuza 2 in Yakuza Kiwami 2 but we have no word of a western release as of yet! I'm itching to get this title because I've gone through Y0 & Kiwami 1 and want to play Kiwami 2 to move on to the PS3 releases of 3, 4 & 5 then finally play Yakuza 6 on PS4. I'd take digital version over nothing. At least i can now complete the series. Look at this! I have a stack of RE games, isn't that just ridiculously amazing to have all these titles readily available like this! Even Code Veronica & RE1-3 are available cheap on the PS3 store and are often on sale too. 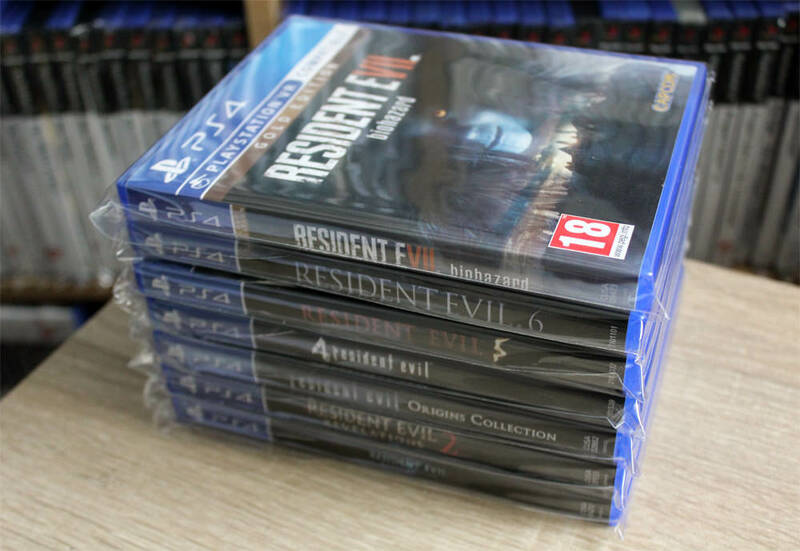 With these release not only has it made the series more accessible but it has also brought much more appeal to the series as a whole for me – Even some of the considered weaker titles like 5 & 6 thrive on PS4 with offering the best online/offline co-op experiences on the system. Im a big Ys fan. Ive played through the first 4 games as well as Origin and VIII. It isnt necessary to play any of them to enjoy Origin or VIII. While there may be a tiny bit of hrmm if you dont recognize a minor back reference, both games are their own story. I personally wish that Falcom will put the rest of the games out there on a compilation like the ones you talked about. Another series that might be fitting with this post would be the Metal Gear series. As far as the games that had Kojima's involvement (including the MX2 games), they have all been part of one big story. Unfortunately, the earliest two releases for the series can be difficult to get into due to their release on an older system that many people aren't familiar with. In addition, the original two games have a significantly different play style. Fortunately, Metal Gear Solid (for the PS1) was written in a way that those who missed the earlier games can still understand whats going on (or understand as much as can be understood in a Kojima game anyway). MGS on PS1 was designed to reward those who played the originals with similar story elements, but also be enjoyable for someone who started the series with that game. For that reason, I recommend anyone new to the series to start there and move forward from that point. Luckily, if you want to start from the very beginning, the MX2 games were available on the HD collections, and nearly all games are available on either the PS3 or PS4 making them fairly attainable. Maybe, just once, someone will call me "sir" without adding, "you're making a scene." Some very good suggestions. Metal Gear has always been a love of mine - You can pretty much be set with the series on PS3 as you mentioned the original Metal Gear games are available on the HD Collection - Metal Gear 2 is certainly worth playing! The only SMT game I've played properly is Persona 3 - Even that is a spin off series though. But dungeon crawlers aren't for me especially in 1st person and t he visual novel aspects jsut add more to put me off - I am interested in the Digital Devil Saga though and hope to get arounf to them one day. I've been going through the database recently and shocked by the amount of 'Tales of' titles we never got, before the PS3 we barely got anything here in the UK! I can understand that the story can be interesting but for the castlevania games it really lacks in quality the 3ds ps3 onward games better to ignore those. The ps2 versions are also not the best but I have to admit that they tried to make a good 3d metroidvania game not bad but not super great compared to the other classics. It is expected though I would kinda expect something like that as far as a 3d metroid vania goes but some things are just better in 2D. Still though the game is pretty good as far the ps2 games go not bad at all. Mario however is in my opinion better in 3D. From mario 64 on it was like mario was more alive and colourfull not to mention the most important thing the mario voice that many mario fans love of antonette. 2D mario is less superior in my opinion. The wii u 3d games are a let down though but otherwise 3d mario is the way to go in the mario sport party mario kart and the mario main adventure games. Have you tried castlevania chronicles? It is the only castlevania 2d tradional arcade game on the ps1 a port of the FX68000 with moderns and the original sound options. As far as the brand new games go ps3 onwards wich in my opinion slaughtered the castlevania series I mean If you like those type of games sure but they are very different compared to the classics and 2d action platform rpg's castlevania games. Still though the entire collection of castlevania games is super accesible as far as downloads go from the nes onwards all for cheap. You do have a switch so they are on there nes snes turbografx gba you name it. The only game that is inaccesible is one of the older castlevania arcade games wich had equal grapics or a bit better than the snes version haunted castle wich was originally only released on the arcade but has a fairly rare expensive physical port on the japanese ps2. The ds games are pretty good but the lack the finesse of console options even though especially dawn of sorrow has more gameplay elements. As far as YS goes isn't the entire series available on PSN for cheap? Even the olders ones of the turbografx pc engine should be on there. There are many physical releases on psp and such but not all and some of them releases aren't to cheap or easy to find. Also getting rid of a Ys Backlog .